By Alexis S. Elizabeth C. and Zoe W.
Owls have a saying: Who Cooks For You!! They look to the sky and look at the ground. By Claire N. and Jessica M.
They have many nocturnal features. They're as big as a barge. The owls are flying silently away. By Marisa K. and Tory H.
And that is how they sing their song! 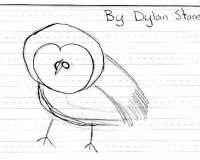 By THOMAS H. and DYLAN S.
The wise old owl howling. The howl sounded like a scowl. Screech it right out, just like a fowl. The wise old owl was very big and he growled. By Meghan M. and Brittany S.
We are two girls in third grade from "SSES " ( Samuel StaplesElementary School ) The three best candidates for best owls in North America are the Barred Owl, the Screech Owl, and the Barn Owl. Screech Owls are the easiest to attract and most compatible. Do you know that the Barred owl sounds like a car about to have an accident (if you know what I mean)? If you would like to have the sounds of all the owls in the world you could buy CD's at your local nature store or at a bird store. And by the way, this subject is suitable for all ages, so you can teach your kids about owls. Owls are very good at seeing. If you saw a mouse and there was an owl in flight way above it, don't think it will get away from the owl. They are very fast when diving to catch prey. Did you know baby owls are called "owlets?" Most Barred owls live in North America. By Scott H. and Carl L.
1. Which animal annoys owls the most? 2.What animal is its enemy? 3.How long until baby owls can fly? to come out when in the light. Your eggs are about to hatch. Find your partner, you'll be a match. How can I see you this way? What is behind those keen eyes of yours? What is behind the locked doors? Little owl Peanut wants some food. Last year June was terribly sued. It's okay 'cause Peanuts' the dude. Listen to an owl song by our students! It takes time to download. Check out the owl research that our fifth graders did!